fimplicit(f) plots the implicit symbolic equation or function f over the default interval [-5 5] for x and y.
fimplicit(f,[min max]) plots f over the interval min < x < max and min < y < max. fimplicit(f,[xmin xmax ymin ymax]) plots f over the interval xmin < x < xmax and ymin < y < ymax. The fimplicit function uses symvar to order the variables and assign intervals. fimplicit(___,LineSpec) uses LineSpec to set the line style, marker symbol, and line color. fimplicit(___,Name,Value) specifies line properties using one or more Name,Value pair arguments. Use this option with any of the input argument combinations in the previous syntaxes. Name,Value pair settings apply to all the lines plotted. To set options for individual lines, use the objects returned by fimplicit. 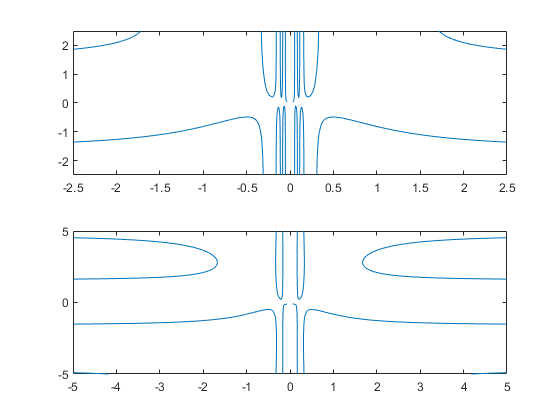 fimplicit(ax,___) plots into the axes specified by ax instead of the current axes gca. fi = fimplicit(___) returns an implicit function line object. Use the object to query and modify properties of a specific line. For details, see ImplicitFunctionLine Properties. 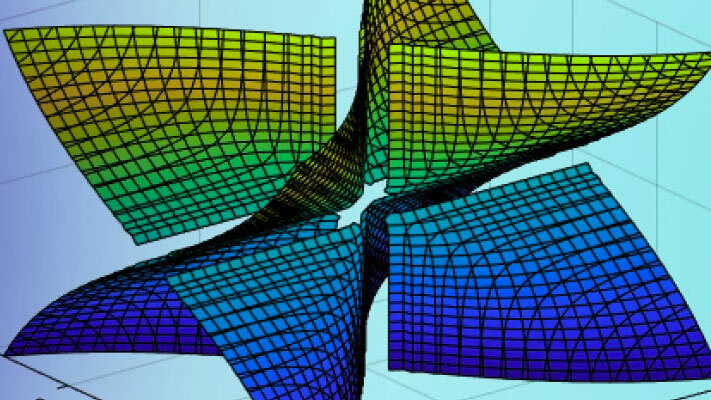 Plot the hyperbola x2-y2=1 by using fimplicit. The fimplicit function uses the default interval of [-5,5] for x and y. Plot the hyperbola described by the function f(x,y)=x2-y2-1 by first declaring the symbolic function f(x,y) using syms. The fimplicit function uses the default interval of [-5,5] for x and y. 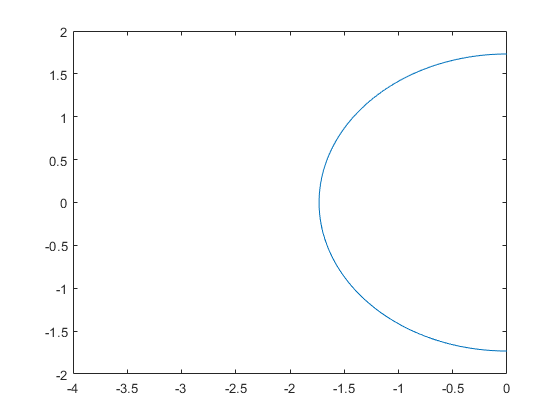 Plot half of the circle x2+y2=3 by using the intervals -4<x<0 and -2<y<2. Specify the plotting interval as the second argument of fimplicit. 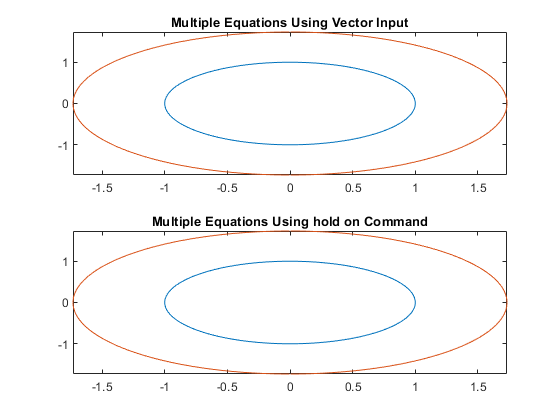 You can plot multiple equations either by passing the inputs as a vector or by using hold on to successively plot on the same figure. If you specify LineSpec and Name-Value arguments, they apply to all lines. To set options for individual plots, use the function handles returned by fimplicit. Divide a figure into two subplots by using subplot. 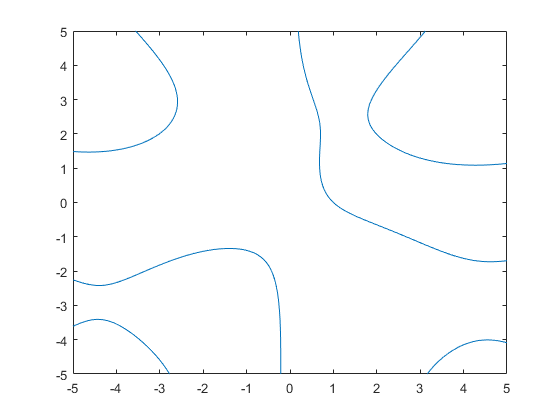 On the first subplot, plot x2+y2==1 and x2+y2==3 using vector input. On the second subplot, plot the same inputs by using hold on. 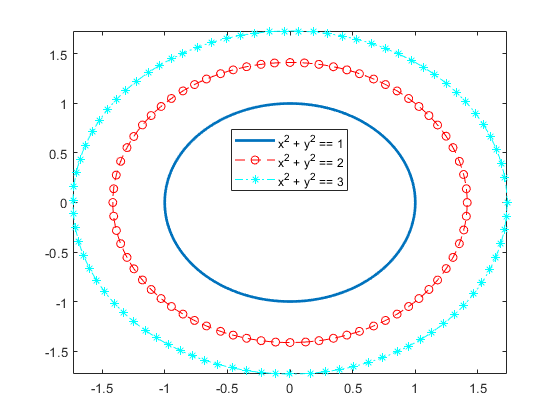 Plot three concentric circles of increasing diameter. For the first line, use a linewidth of 2. For the second, specify a dashed red line style with circle markers. For the third, specify a cyan, dash-dot line style with asterisk markers. Display the legend. Plot ysin(x)+xcos(y)=1. Specify an output to make fimplicit return the plot object. Change the plotted equation to xcos(y)+ysin(x)=0 by using dot notation to set properties. Similarly, change the line color to red and line style to a dash-dot line. The horizontal and vertical lines in the output are artifacts that should be ignored. 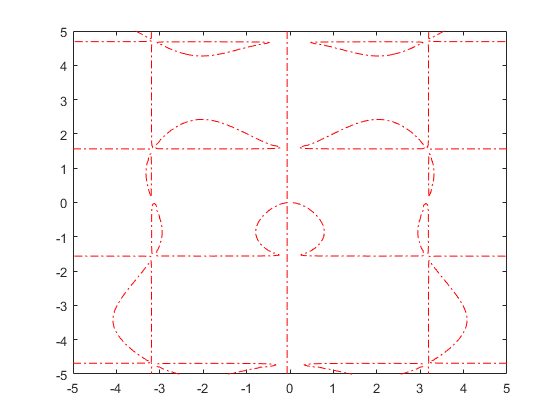 Plot xcos(y)+ysin(x)=1 over the interval -2π<x<2π and -2π<y<2π. Add a title and axis labels. Create the x-axis ticks by spanning the x-axis limits at intervals of pi/2. Display these ticks by using the XTick property. Create x-axis labels by using arrayfun to apply texlabel to S. Display these labels by using the XTickLabel property. Repeat these steps for the y-axis. When you zoom into a plot, fimplicit re-evaluates the plot automatically. This re-evaluation on zoom can reveal hidden detail at smaller scales. Divide a figure into two by using subplot. Plot xcos(y)+ysin(1/x)=0 in both the first and second subplots. Zoom into the second subplot by using zoom. The zoomed subplot shows detail that is not visible in the first subplot. Implicit equation or function to plot, specified as a symbolic equation, expression, or function. If the right-hand side is not specified, then it is assumed to be 0. Plotting range for x and y, specified as a vector of two numbers. The default range is [-5 5]. 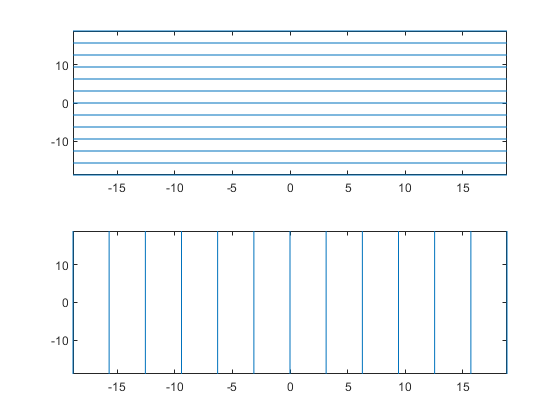 Plotting range for x and y, specified as a vector of four numbers. The default range is [-5 5 -5 5]. Axes object. If you do not specify an axes object, then fimplicit uses the current axes gca. The function line properties listed here are only a subset. For a complete list, see ImplicitFunctionLine Properties. Number of evaluation points per direction, specified as a number. The default is 151. One or more implicit function line objects, returned as a scalar or a vector. You can use these objects to query and modify properties of a specific line. For a list of properties, see ImplicitFunctionLine Properties. fimplicit assigns the symbolic variables in f to the x axis, then the y axis, and symvar determines the order of the variables to be assigned. Therefore, variable and axis names might not correspond. To force fimplicit to assign x or y to its corresponding axis, create the symbolic function to plot, then pass the symbolic function to fimplicit. 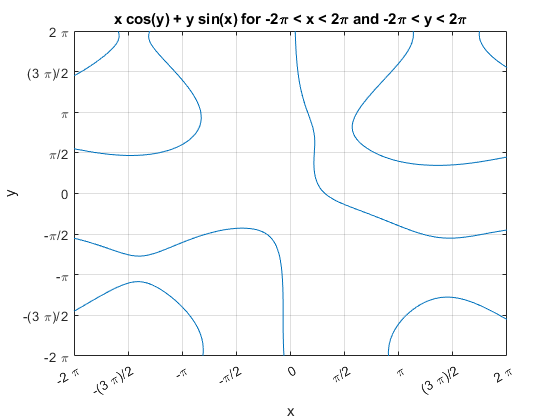 For example, the following code plots the roots of the implicit function f(x,y) = sin(y) in two ways. 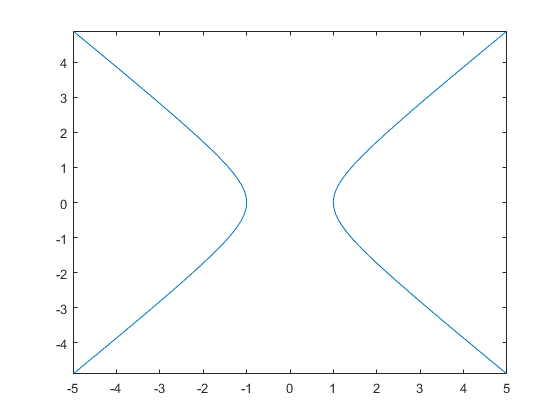 The first way forces the waves to oscillate with respect to the y axis. The second way assigns y to the x axis because it is the first (and only) variable in the symbolic function.